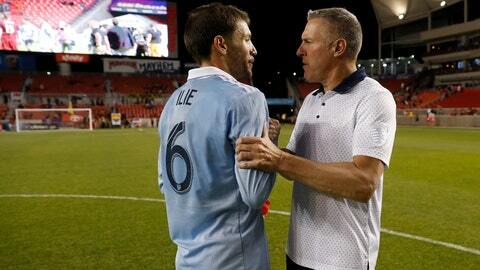 Midfielder Ilie Sanchez (with manager Peter Vermes) earned his first invitation to the MLS All-Star Game. Sporting Kansas City will have two representatives at the MLS All-Star Game with the addition to the 26-man roster of midfielder Ilie Sanchez, the league announced Friday. Sanchez, a first-time MLS All-Star, joins Sporting KC defender Graham Zusi, an MLS All-Star Fan XI selection. The Aug. 1 game at Mercedes-Benz Stadium in Atlanta pits MLS All-Stars against Italian powerhouse Juventus. The MLS All-Star roster consists of the All-Star Fan XI, two Commissioner’s Picks and 13 players selected by All-Star coach Gerardo “Tata” Martino of Atlanta United FC. Zusi was one of three defenders voted to the Fan XI, while Ilie was one of Martino’s selections. Sanchez, 27, has played every minute of every match for Sporting KC this season, his second with the club. He leads MLS in both successful passes (1,014) and successful passes in the attacking half (584) while ranking third among MLS field players in recoveries (149). Sanchez already has recorded MLS career highs in goals (two) and assists (three) in 2018.